For other people with similar names, see Dan Payne (disambiguation). Daniel Alexander Payne (February 24, 1811 – November 2, 1893) was an American bishop, educator, college administrator and author. A major shaper of the African Methodist Episcopal Church (AME), Payne stressed education and preparation of ministers and introduced more order in the church, becoming its sixth bishop and serving for more than four decades (1852–1893) as well as becoming one of the founders of Wilberforce University in Ohio in 1856. In 1863 the AME Church bought the college and chose Payne to lead it; he became the first African-American president of a college in the United States and served in that position until 1877. By quickly organizing AME missionary support of freedmen in the South after the Civil War, Payne gained 250,000 new members for the AME Church during the Reconstruction era. Based first in Charleston, he and his missionaries founded AME congregations in the South down the East Coast to Florida and west to Texas. In 1891 Payne wrote the first history of the AME Church, a few years after publishing his memoir. Daniel Payne was born free in Charleston, South Carolina, on February 24, 1811, of African, European and Native American descent. Daniel stated "as far as memory serves me my mother was of light-brown complexion, of middle stature and delicate frame. She told me that her grandmother was of the tribe of Indians known in the early history of the Carolinas as the Catawba Indians." He also stated that he descended from the Goings family, who were a well known free colored/Native American family. His father was one of six brothers who served in the Revolutionary War and his paternal grandfather was an Englishmen. His parents London and Martha Payne were part of the "Brown Elite" of free blacks in the city. Both died before he reached maturity. While his great-aunt assumed Daniel's care, the Minors' Moralist Society assisted his early education. Payne was raised in the Methodist Church like his parents. He also studied at home, teaching himself mathematics, physical science, and classical languages. In 1829, at the age of 18, he opened his first school. After the Nat Turner Rebellion of 1831, South Carolina and other southern states passed legislation restricting the rights of free people of color and slaves. They enacted a law on April 1, 1835, which made teaching literacy to free people of color and slaves illegal and subject to fines and imprisonment. With the passage of this law, Payne had to close his school. In May 1835, Payne sailed from Charleston to Philadelphia in search of further education. Declining the Methodists' offer, which was contingent on his going on a mission to Liberia, established as a colony for free blacks from the United States, Payne studied at the Lutheran Theological Seminary at Gettysburg in Pennsylvania. Payne never worked as a Lutheran priest. One source claims he had to drop out of school because of problems with his eyesight. Another source claimed no congregation called him and the Lutheran Church told him to work through the Methodist Episcopal Church. Payne married in 1847, but his wife died during the first year of marriage from complications of childbirth. In 1854, he married again, to Eliza Clark of Cincinnati. By 1840, Payne started another school. He joined the African Methodist Episcopal Church (AME) in 1842. He agreed with the founder, Richard Allen, that a visible and independent black denomination was a strong argument against slavery and racism. Payne always worked to improve the position of blacks within the United States; he opposed calls for their emigration to Liberia or other parts of Africa, as urged by the American Colonization Society and supported by some free blacks. Payne worked to improve education for AME ministers, recommending a wide variety of classes, including grammar, geography, literature and other academic subjects, so they could effectively lead the people. In the ensuing decades' debates about "order and emotionalism" in the African Methodist Church, he sided consistently with order. The AME's first task was "to improve the ministry; the second to improve the people". At a denominational meeting in Baltimore in 1842, Payne recommended a full program of study for ministers, to include English grammar, geography, arithmetic, ancient history, modern history, ecclesiastical history, and theology. At the 1844 AME General Conference, he called for a "regular course of study for prospective ordinees", in the belief they would lift up their parishioners. In 1845 Payne established a short-lived AME seminary, and succeeded in gradually raising the educational preparation required for ministers. Payne also directed reforms at the style of music, introducing trained choirs and instrumental music to church practice. He supported the requirement that ministers be literate. Payne continued throughout his career to build the institution of the church, establishing literary and historic societies and encouraging order. At times he came into conflict with those who wanted to ensure that ordinary people could advance in the church. Especially after expansion of the church in the South, where different styles of worship had prevailed, there were continuing tensions about the direction of the denomination. In 1848, Bishop William Paul Quinn named Payne as the historiographer of the AME Church. In 1852, Payne was elected and consecrated the sixth bishop of the AME denomination. He served in that position for the rest of his life. 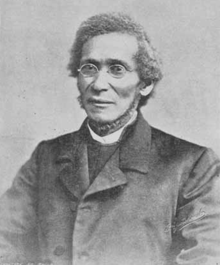 Together with Lewis Woodson and two other African Americans representing the AME Church, and 18 European-American representatives of the Cincinnati Methodist Episcopal Conference, Payne served on the founding board of directors of Wilberforce University in Ohio in 1856. Among the trustees who supported the abolitionist cause and African-American education was Salmon P. Chase, then governor of Ohio, who was appointed as Chief Justice of the US Supreme Court by President Abraham Lincoln. The denominations jointly sponsored Wilberforce in 1856 to provide collegiate education to African Americans. It was the first historically black college in which African Americans were part of the founding. Wilberforce was located at what had been a popular summer resort, called Tawawa Springs. It was patronized by people from Cincinnati, including abolitionists, as well as many white planters from the South, who often brought their mistresses of color and "natural" (illegitimate) multi-racial children with them for extended stays. In one of the paradoxical results of slavery, by 1860 most of the college's more than 200 paying students were mixed-race offspring of wealthy southern planters, who gave their children the education in Ohio which they could not get in the South. The men were examples of white fathers who did not abandon their mixed-race children, but passed on important social capital in the form of education; they and others also provided money, property and apprenticeships. With the Civil War, the planters withdrew their sons from the college, and the Cincinnati Methodist Conference felt it needed to use its resources to support efforts related to the war. The college had to close temporarily because of these financial difficulties. In 1863, Payne persuaded the AME Church to buy the debt and take over the college outright. Payne was selected as president, the first African-American college president in the United States. The AME had to reinvest in the college two years later, when a southern sympathizer damaged buildings by fire. Payne helped organize fundraising and rebuilding. White sympathizers gave large donations, including $10,000 donations each from founding board member Salmon P. Chase and a supporter from Pittsburgh, as well as $4200 from a white woman. The US Congress passed a $25,000 grant for the college to aid in rebuilding. Payne led the college until 1877. Payne traveled twice to Europe, where he consulted with other Methodist clergy and studied their education programs. In April 1865, after the Civil War, Payne returned to the South for the first time in 30 years. Knowing how to build an organization, he took nine missionaries and worked with others in Charleston to establish the AME denomination. He organized missionaries, committees and teachers to bring the AME church to freedmen. A year later, the church had grown by 50,000 congregants in the South. By the end of the Reconstruction era in 1877, AME congregations existed from Florida to Texas, and more than 250,000 new adherents had been brought into the church. While it had a northern center, the church was strongly influenced by its expansion in the South. The incorporation of many congregants with different practices and traditions of worship and music styles helped shape the national church. It began to reflect more of the African-American culture of the South. In 1881, he founded the Bethel Literary and Historical Society, a club which invited speakers to present on topics relevant to African-American life and a part of the Lyceum movement. Payne died on November 2, 1893, having served the AME Church for more than 50 years. 1888, Recollections of Seventy Years, a memoir. 1891, The History of the A. M. E. Church, the first history of the denomination. The historian James T. Campbell wrote of Payne in his Songs of Zion: The African Methodist Episcopal Church in the United States and South Africa (1995): "No single individual, with the possible exception of Richard Allen himself, did more to shape the trajectory and tone of African Methodism." Daniel Payne College, a historically black college that operated in Alabama from 1889 to 1979, was named in his honor. After the college closed, the city of Birmingham renamed a street Daniel Payne Drive. The Payne Theological Seminary in Wilberforce, Ohio is named in his honor. A Pennsylvania State Historical Marker was installed in his honor at 239 N. Washington St. at Gettysburg College, recognizing his study there. Payne elementary school in Washington, DC is named for him. ↑ Gelberding, C.H., Life and Letters of W. A. Passavant, D. D., Illinois Historical Society, 1909 at https://archive.org/stream/lifelettersofwap00gerb/lifelettersofwap00gerb_djvu.txt at p. 529 et seq. ↑ Smith, Jessie Carney, ed. (2013). Black Firsts: 4,000 Ground-Breaking and Pioneering Historical Events (3rd ed.). Detroit: Visible Ink Press. p. 132. ISBN 978-1-57859-369-9. ↑ McHenry, Elizabeth (2002). Forgotten readers: recovering the lost history of African American literary societies. Duke University Press. pp. 141–185. ISBN 978-0-8223-2995-4. Thomas, Rhondda R. & Ashton, Susanna, eds. (2014). The South Carolina Roots of African American Thought. Columbia: University of South Carolina Press. "Daniel Payne (1811-1893)," p. 17-28.